Despite getting extremely close to agreeing to negotiations to avert hostilities, the U.S. and Japan failed to make peace and Pearl Harbor was bombed on December 7th, 1941. 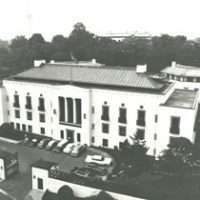 In these excerpts from his memoirs, Robert A. Fearey, at the time private secretary to Ambassador to Japan Joseph C. Grew, describes the surprisingly pleasant conditions of daily life in Embassy Tokyo after war was declared, even during the Doolittle Raid, including setting up golf tournaments on embassy grounds, drinking up the Ambassador’s wine collection, and how they smuggled out Ambassador Grew’s final report on Japan. Their lengthy voyage home, by way of Rio, brought them in contact with other Americans who had a far different experience, having been tortured or nearly starved to death before their release. You can read Feary’s account of the negotiations as well as other stories of World War II. Go here to read about U.S. diplomats who were held by the Nazis. 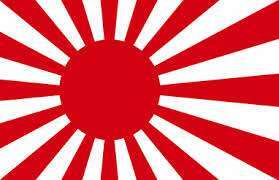 FEAREY: Returning to Pearl Harbor Day in Tokyo, at about 11:00 a.m., a car containing several Japanese officials drove into the compound, and a Mr. Ohno of the Foreign Office asked to see the Ambassador…. “1. The functions of the Embassy and the Consulates will be suspended as of today. 2. Members of the Embassy and Consulates will be accorded protection and living facilities in accordance with international usages. 3. In order to secure protection and facilities aforementioned, it is recommended that all the members of the Embassy be congregated in the Embassy compound. 4. Communication with the outside, including telephone and telegraph, will be suspended. In the case anyone desires to go out, permission must be obtained from the Gaimusho through the officer who will be posted in front of the Embassy, liaison officer, Mr. Matsuo. He has come here with me. 5. As soon as a country representing your interests is nominated, contact between your Embassy and representatives of the said country will be allowed as is necessary for the purpose of representing your interests. 6. Due attention is being paid to protecting the citizens of the United States. 7. All wireless transmitting sets will be surrendered at once. 8. All shortwave, wireless receiving sets, private as well as official, the use of which will no more be acquiesced to be handed over. Ohno then asked that someone be assigned to take the police representatives of the Department of Communications around to each office and apartment to be shown every receiving and transmitting radio in the premises. After phoning Grew, who felt that we were not in a position to refuse the request, as it was a case of force majeure, Crocker agreed to this under protest. Again demonstrating youthful indiscretion, I went back to my apartment and effectively hid a tiny pocket radio which a college housemate and amateur radio expert had made for me and which I had brought along to Japan. The radio was about five inches long, three inches wide and three-quarters of an inch thick and had what my friend had told me might be two of the smallest tubes ever made. I carried it inside the upper pocket of my jacket, with holes cut in the pocket so I could reach in to turn the control knobs. A thin wire ran up under the back of my coat to a small, almost invisible ear plug. With this device, I had been able, unbeknownst to anyone, to listen to the radio during classes at college and even when riding my motorcycle. In Japan, I had tried it out a few times and had no trouble receiving Japanese language stations. In our current predicament, I thought it might be a useful source of information, and in any case, I did not want to lose it. The searchers never found it, and it did prove to be a moderately useful source of information until the tiny batteries wore out. I brought it back to the States on the repatriation ship. Even before Ohno’s arrival, a group of us under Bohlen’s direction had started to burn the Embassy code books and classified files. 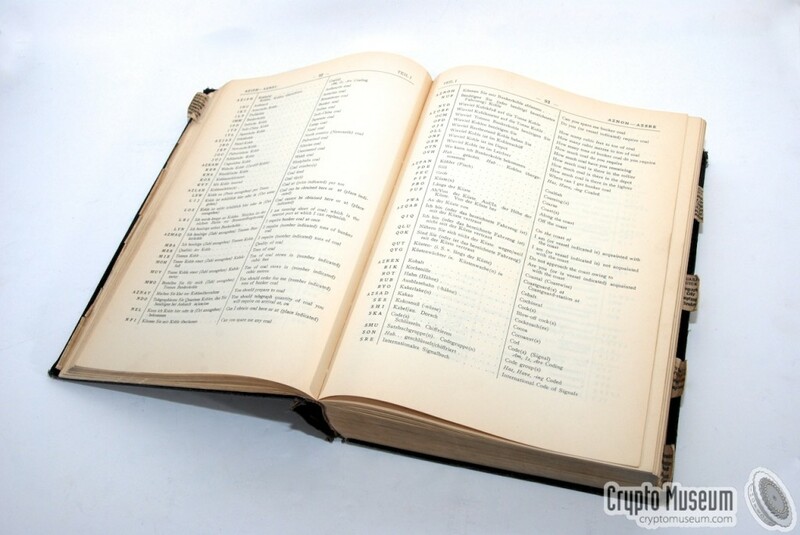 The code books were numerous and bulky and the files extensive. Burning them effectively was no easy task, particularly in contrast with modern destruction techniques. The burning was carried on in metal waste baskets indoors and steel drums outdoors in the garage enclosure. From time to time, in spite of our best efforts, whole or partial pages of unburned code or text would float up and away over Tokyo. Ohno and the agents searching for radios showed no interest in the destruction operation, saying that there orders were solely to find and remove radios, particularly, of course, transmitters, of which the Embassy had none. All our electronic message traffic was by coded text through the Japanese Postal and Telegraph Service. Ohno’s lack of interest may have resulted from the fact, as Konoye had informed Grew a few months before, that Japanese cryptographers had broken all our codes except, Konoye thought, one. In the days that followed, our group of 65 organized itself under Grew’s and Dooman’s direction into a smoothly running, not unpleasant routine. Fortunately, as one of my responsibilities, and with the possibility of war all too apparent, I had in August mailed into San Francisco a large grocery order, after obtaining from each American staff member a list of exactly what he or she wanted, paid in advance. The order arrived only a week or two before Pearl Harbor and proved to be a godsend. Helen Skouland, a file clerk who later married career Ambassador H. Freeman Mathews, set up a store in a chancery office of all the assembled goodies. 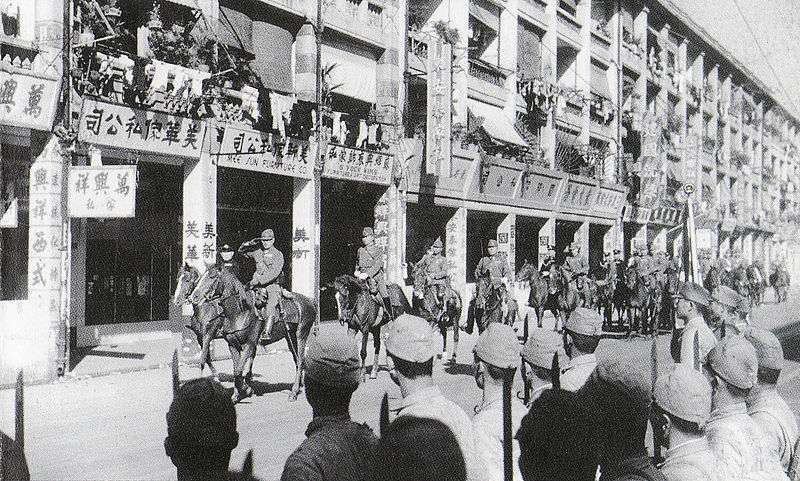 She and I decided that in the circumstances, a “Communist” distribution and accounting system was indicated, based not on who had ordered what but on what the relative needs were, including those of the ten or so American businessmen who had sought refuge in the compound when the war broke out and who had not participated in the order. 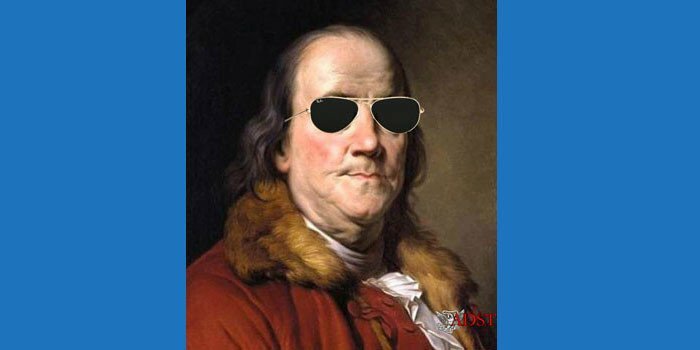 So we devised a system under which the original orders were nullified, and all items were essentially rationed, with payment recalculated on the basis of a combination of need and ability to pay. The arrangement was readily accepted, and the groceries were successfully strung out to last until our departure. Fresh produce was procured from the Tokyo markets through our Japanese servants, almost all of whom stayed loyally with us to the end. As the youngest member of the group, except for the eight-year old daughter of the Naval Attaché and his wife, Cynthia Smith-Hutton, I was appointed Sports Director. This was not an insignificant assignment. Although most of the group busied themselves pretty well writing, reading, learning to type or whatever, there was inevitably a good deal of leisure time, and sports had a definite morale and fitness importance. So Bohlen, the Assistant Naval Attaché, Commander Mert Stone and I laid out a nine-hole golf course, totaling over 500 yards among and over the buildings; we set up a badminton court and ping pong table in the garage courtyard; and I organized a succession of hotly contested tournaments in all three sports, with prizes. Some of the prizes, such as engraved silver cups and ashtrays, I ordered from outside, and some were sent in my friends of the Grews, particularly the Finnish Ambassador, Lars Tilltse and his wife…. Everyone at the outset did his or her own laundry in the sink or bathtub, as the sight of drying linens and apparel around the compound attested. One day, while playing hide-and-seek with my best friend and constant companion, Cynthia, we came upon an old washing machine in Grew’s attic. I managed to get it going, had it brought down to a room in the chancery basement and sent Cynthia to tell all and sundry that we were ready to take over their laundry chores, including delivery back to the apartments if they would bring their things down suitably bundled to us by 9:00 every morning. The next day, the pile waiting besides the machine was impressive, and it remained so for the rest of our stay. Cynthia performed all deliveries, including up the considerable climb to the residence. Our only misadventure was when Mrs. Grew sent down some of her best silk curtains, and I failed to see when I put them in the machine that pair of Gene Dooman’s black socks were still in it. I accompanied Cynthia on the delivery. Mrs. Grew, after recovering from the shock, was kind enough to say that grey had always been her favorite color. To enliven our golf games, I organized a running sweepstakes under which, if you drew the name of the next person to break a window, you won the pot. Needless to say, with some of the holes going over three-story apartments houses into small, invisible-to-the-driver greens, a great many balls ended up in the Tokyo streets. Fortunately, we had a lot of balls and never ran out. And every day, except Sunday, the Grews and four or five other avid poker players gathered for their marathon poker series, which continued on the repatriation ships almost to New York. The stakes were fairly high, and at one point, the indebtedness of an Assistant Army Attaché reached a level uncomfortable to the Grews and the rest of the group as it was to him. But happily in the end, he pulled up almost even. The bridge players, led by Mrs. Grew, were equally committed to their almost daily game. In mid-April, I was playing golf on our private course with Major Stanton Babcock, the Assistant Army Attaché (believe it or not, another Grotonian! ), when we heard explosions in the distance. We looked up and saw a rather large military aircraft slowly flying quite low over the Diet (Parliament) building with black anti-aircraft bursts visible behind and above. 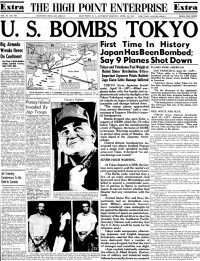 As we watched it disappear to the south, obviously untouched by the anti-aircraft fire, Babcock said that he was sure that it was an American bomber but that he had no idea how it could have got to Tokyo. The most likely way was from an aircraft carrier, but he had never heard of a plane of that size taking off from a carrier. We dropped our clubs and ran up for a better view from the residence. There we encountered Grew with the Swiss Minister, Mr. Gorge. Grew said that he had been bidding the Minister farewell when they had seen and heard a number of large airplanes overhead. Shortly after, they had observed fires burning in different directions with lots of smoke. Sirens and gunfire could still be heard as we stood there, but the planes were no longer in view. The papers that evening reported that nine enemy aircraft had been shot down over various parts of Japan, and several photos were shown to prove it. On examination, however, our military colleagues concluded that the photos were all of one downed plane, taken from different angles. Only later did we learn through Gorge that we had a ringside view of the Doolittle raid [the daring air attack on Tokyo on April 18, 1942, which was designed to show that Japan was vulnerable and to boost U.S. morale after Pearl Harbor]…. Midway through the internment, in late March, Grew, whose fondness for golf was well known to Japanese officialdom, was informed by the Foreign Office that he, Dooman and one or two other Embassy officers would be permitted to play a game of golf, maybe two, at one of the Tokyo courses. The offer was tempting, as the Japanese knew it would be, but after soul-searching deliberation, Grew informed Dooman and the rest of us that he had decided to decline. There would, however, be no objection if we wished to go, not as sport or entertainment, but because we felt the need for reasons of physical or mental health. His undoubtedly well-justified concern regarding his own acceptance of the invitation was that the Japanese would photograph him on the course, and he had no desire to see himself so pictured in the world press at that point. He knew that a number of Allied diplomats had accepted the offer but that the British Ambassador had not. Needless to say, the rest of us followed Grew’s lead and did not go out either. Returning to the story of our internment, the arrangements through the Swiss and Spanish governments for our exchange with Japanese diplomats, businessmen and others held in the U.S. finally fell into place, with June 18 as our scheduled sailing date. 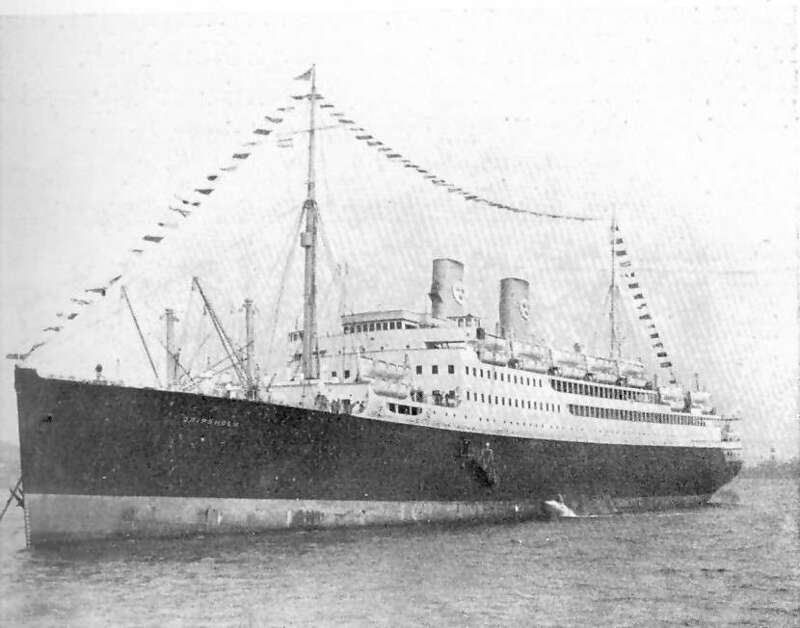 We would travel aboard the Asama Maru via Hong Kong, Saigon and Singapore, through the Sunda Straights and across the Indian Ocean to Lourenco Marques (now Maputo), the capital of Mozambique. There we would meet the Swedish cruise ship, Gripsholm, which would have brought the Japanese repatriates from New York. They would board the Asama Maru for Tokyo while we proceeded to the Gripsholm via Rio to New York. As June 18 approached, Grew pondered how he could most safely carry out his report. While our persons and effects should, under diplomatic usage, not be searched, we had no assurance that the Japanese would respect that rule, as they had not respected many other rules of diplomatic privilege during the internment. After discussing the problem with Dooman and others, he decided to make seven copies of the sixty-page, legal-size document to be carried, one copy each, on his own, Dooman’s, Crocker’s, Bohlen’s, my and a couple of other Embassy officers’ persons on the theory that the Japanese would be less likely to search us than our baggage. The problem, it became apparent when the seven copies were ready, was that it did not fold very well, producing a noticeable bulge in our pockets. So someone, I forgot who, conceived the idea of making two holes at the top of each of the copies and hanging them down our backs inside our shirts, suspended by concealed strings around our necks. On our arrival aboard the ship, we would all repair to the Grew’s cabin to hand our respective copies over to him, to be kept in a locked box throughout the voyage. The early morning of June 17 we were taken in a line of police-escorted taxis to the Tokyo Railroad Station. We walked in between lines of police to a large waiting room. There had been collected several score American and other diplomats, missionaries, businessmen, newsmen and others who had been held at various points around Tokyo. The newsmen, who the Japanese assumed were all spies, had been held in closed confinement or prison, often in solitary, constantly interrogated and in many cases, tortured. 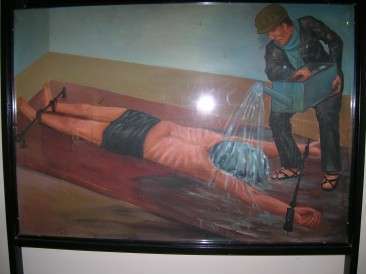 (Later, on the ship, some of them demonstrated the “water cure” torture to which they had been subjected — some many times.) There was much handshaking as friends met after six months of separation and exchanged experiences. After an hour or so, we boarded a special train and rode by a roundabout route through Kawasaki directly to the ship. There were no searches or inspections of any kind on the train or as we boarded the Asama Maru, a fairly large liner. Aboard the ship, we were joined by many more American and other repatriates collected from all over Japan. Soon word spread that a hitch had developed and that our departure would be delayed. The ship moved out to anchor beyond the breakwater, and the next day, it moved again to another anchorage further out in the bay. For a week, we sat there, with launches full of Foreign Office and other officials and police coming and going and with constant rumors of our imminent departure or our return to shore. Our newsman, Max Hill of AP, who had spent almost his entire internment in solitary under torture, said that if we did not depart, he would commit suicide. He clearly meant it and in fact did commit suicide some years later, perhaps due in part to what he had suffered in confinement. About midnight of June 24, I went on deck. a large group of crewmen were debarking from a launch, a nearby gunboat was frantically signaling with lights and further down the deck, I heard policemen saying goodbye. I woke some Embassy colleagues up in time to see the Foreign Office launch leave for the last time. The anchor came up, and the ship began to move. And then, just as we were being ordered off the decks, presumably to prevent our carrying back military secrets of the harbor, the great white cross, perhaps forty feet wide and tall, high up at the front of the ship, lit up. Our lives would depend on its safe-conduct message being seen and respected by enemy and friendly surface warships and submarines as we made our way through active war zones around Asia and across the Indian Ocean to Africa. This is perhaps a fit point to repeat a story Chip Bohlen told me years later. He had attended a party in Moscow where the company included several Soviet naval officers. Someone brought up the diplomatic exchanges early in the war, and Bohlen, fluent in Russian, mentioned that he had been on the Asama Maru. One of the former naval officers looked at him and said that he (Bohlen) was lucky to be alive. He told how he had been a submarine skipper in the Indian Ocean, and one very dark and foggy night, he had seen a large ship about to cross his path. Knowing of no Allied vessels of that size in the area, he had assumed it to be an enemy ship. He had ordered torpedoes into the tubes and was just about to give the order to fire when the fog cleared, and he saw a great, lighted cross. He and Bohlen toasted fate and each other with vodka. On June 27, we passed between the mountainous west coast of Taiwan and two small green islands. Two Japanese submarines surfaced and traveled alongside us for a while. Two days later, we anchored (back of) Hong Kong in Repulse Bay. U.S. Consul General Southard was one of the first to come on board. He had lost fifty-four pounds in confinement, and his clothes hung on him like sacks. About 100 repatriates were added to our number, including [famed journalist] Joe Alsop. That brought us to about 800 souls, with another 150 due to come on in Saigon. Knowing Alsop (still another Grotonian), and being in charge of billeting, I invited him to join the five of us in my cabin. He told us harrowing stories of the fall of Hong Kong, and we endured the clacking of his portable typewriter to all hours all the way to Rio, as he prepared to file them on our arrival there. On July 2, we sailed all day along the Indochina coast, moving slowly to allow another repatriation ship, the Conte Verdi (which years later burned in a famous accident at sea), to catch up with us at Singapore. The next day we started up the Saigon River, anchoring ten miles short of the city. Annamese swarmed around the ship in their little boats, yelling, diving for coins and selling all kinds of fruit, the first many of our company had seen in a long time. We dropped money down in waste baskets as the end of ropes and pulled up our purchases. Some of us fell for an impressive “cognac” in impressively labeled bottles, which turned out to be a mixture of alcohol, vanilla extract and river water. I kept my bottle in the attic for thirty years and then poured it down the toilet…. One incident which I neglected to include in my diary is of some interest. Grew had worried as we approached Lourenco Marques what he should do if he met Japanese Ambassador to the U.S., Admiral Kichisaburu Nomura, in the street. They were longtime friends, and he would normally have been glad to greet him, but now Nomura was an ambassador of a country with which the U.S. was at war. Grew had no desire to have a photograph of Nomura and him chattering together shown all over the Free World. He decided that if they met, he would bow stiffly and pass on without pausing. And meet they did, in the main street. 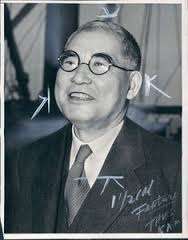 Nomura was accompanied by Ambassador Saburo Kurusu, who had been sent to Washington a month or so before the outbreak of war to assist Nomura. I happened to be with Grew. Nomura smiled broadly at Grew and started over with his hand outstretched, trailed by Kurusu. Grew never slackened his pace. Bowing coldly, he ignored the outstretched hand and passed on. The incident long rankled with him, but he never doubted that he had done the right thing…. The voyage across the South Atlantic was uneventful. Life aboard the Gripsholm was in every respect in happy contrast with what it had been on the Asama Maru — outdoor games, swimming pool, movies, excellent food. Most of those who were thirty, forty, or even fifty pounds underweight and/or suffering from nutritional diseases made a good start on their recovery. I will resort again to my diary for the highlights of our stopover in Rio. The trip from Rio to New York was another two-week pleasure cruise aboard the Gripsholm…. We docked in New York on August 25th. The ship was immediately flooded with State Department and other officials and newsmen, almost all of whom headed for Grew. After he had met with the press and dealt with the most pressing arrival problems, the two of us were taken by limousine to the station and entrained for Washington. Thank you. We’ve corrected the name to Eugene Dooman.